Ashland Place Historic District is generally located along Hoover, Vernon and Ashland Avenues between Central Avenue and 3rd Street in Phoenix, Arizona. Walking distance to the Valley Metro light rail and walkable to many businesses, museums such as the Heard Museum, The Phoenix Art Museum and a variety of restaurants, Ashland Place Historic District is a highly desirable location connecting all that’s in the heart of the valley. If you like Ashland Place’s connectivity and walkable features, you may want to also check out Willo, Del Norte, Country Club Park, Pierson Place, the east end of F.Q. Story and East Alvarado historic districts along with homes on Central Avenue. Architectural Styles and Square Footage in this quaint neighborhood are wonderful Period Revival style homes, mainly Tudor Revivals, Spanish Revivals and Bungalows with darling, classic details can be found throughout the bulk of Ashland Place, especially on Hoover and Vernon Avenues. Homes average about 1,300 square feet on average. Homes along Ashland Avenue were built a bit later and so are a bit larger Ranch-style homes that average about 1,500 square feet with usually 3 bedrooms and 2 bathrooms. 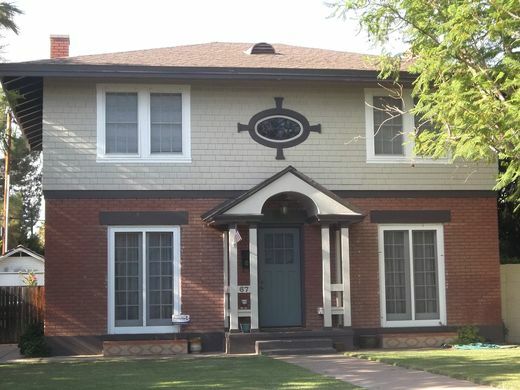 Designated a Maricopa County Phoenix historic district in May of 1992, its period of significance is 1920-1904. Ashland Place was built as a subdivision of Dwight B. Heard’s ‘Los Olivios’ subdivision. Homes in this area consist of Bungalow and Period Revival built in the 1920’s. Ashland Place Subdivision and is approximately 150 acres in size. The Ashland Place subdivision was platted in 1920, consisting of 76 lots along Hoover and Vernon Avenues between Central Avenue and 3rd Street. By 1926, 47 homes had been built on a speculative basis. If you love the homes in Ashland Place Historic District but can’t find one for sale (as you may see zero homes for sale here), you might also like Country Club Park or the East Alvarado historic districts (Ranch style) or Del Norte Place (Period Revivals). If it’s the connectivity to the light rail and proximity to Central Avenue that draws you to Ashland Place, check out the Willo and Pierson Place historic districts. They are very well connected, too. If you like the luxury condo lifestyle, you may want to consider checking out life at The Regency House on Central high-rise. This luxurious condominium building, built in 1964 was just recently officially designated a historic as part of Ashland Place Historic District, owners are now privy to a 50% tax reduction! The building is glorious and recently underwent more than a $7,000,000 renovation keeping it’s mid-century look and feel; seriously a very COOL building!